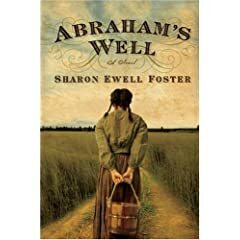 Abraham’s Well, by Sharon Ewell Foster. Fantastic book. I honestly couldn’t put it down, and read it from start to finish in less than 24 hours! It follows the story of Armentia, a young Cherokee Indian girl, through her life of hardship and tragedy. Armentia and her family are slaves (owned by other Indians). They live a happy life, until the government announces its decision to relocate all Indian people across the country ‘for their own good’. They, along with thousands of others make the journey, over 1000 miles on the ‘trail of tears’. Later, Armentia is sold (as a slave), on two separate occasions. Throughout this time she also suffers the loss of her beloved brother, father and later, mother. She lives through the American civil war (losing even more people dear to her), and eventually becomes a free woman. It’s an incredibly sad tale, based on true events. I was completely unaware of a lot of what is told in this book. I was very interested in the history of the Indian people, and the similarities between what happened to them and what took place here with Indigenous Australians. It’s truly unimaginable and inconceivable. I really enjoyed the book, and would highly recommend it, especially if you’re a fan of historical fiction. My only ‘con’, is that the last quarter or so of the book seemed far too rushed, too much happened in too short of a space, which made it feel a bit contrived. But overall, a great read. Good story, believable characters, and I learned some really interesting stuff! Oh nice i will have to check this book out, dont happen to know if it's in the library at all do you? Yep it's at our library.. that's where I got it from! Proud doesn’t even cut it!